In 2019, Avalon Waterways will feature a full fleet of suite ships, as their 3 non suite ships leave the fleet at the end of 2018. This means that 85% of Avalon Waterways cabin occupancy will be in their suites which are 30% larger than the industry standard and benefit from those amazing panoramic windows and beds with a view. Early booking pledge When you book early, you’re guaranteed to get the best deal. They're so confident of this that they’ll refund you the difference if a better value offer is subsequently available. 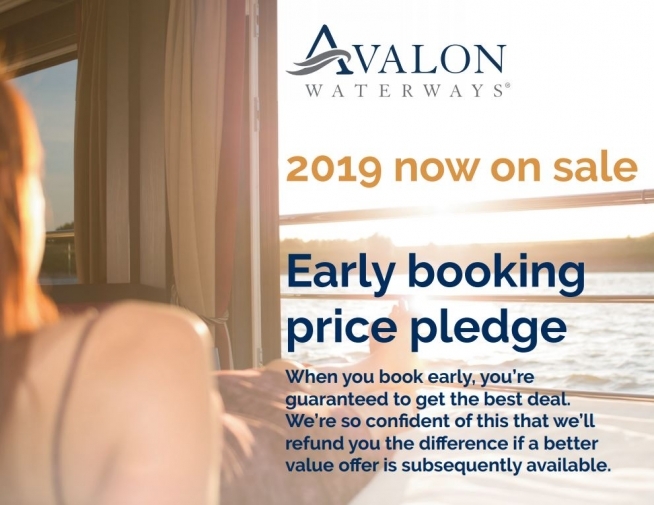 Past passenger reward If you’ve booked with Avalon before, they’d like to say thank you by increasing the past passenger discount to £100pp discount when making a new booking between 05/03/18 and 31/05/18 for departure between 01/01/19 and 31/12/19. Complimentary Business class flight upgrade when you book a Royal Suite New Royal Suite bookings made between 05/03/18 and 30/06/18 for European sailings that depart between 01/01/19 and 31/12/19 will receive a complimentary upgrade to Business Class both ways on BA flights only (Lufthansa on Active Discovery on the Danube), and to Standard Premier on return Eurostar journeys. No single supplements On selected European departures, solo travellers will not pay an additional supplement for sole occupancy of a twin suite. These are sold on a first come, first served basis, so book early. VIP private home pick-up service included Start your holiday in style with our award-winning airport transfer service. A private transfer to and from your airport or station is included in your holiday price, within 100 miles.